Kristen is hostess for the SDC206 Stampotique Designer's Challenge. Kristen says she loves the calm and soothing feeling of the ocean and finds this as her happy place. I'm inclined to agree that the ocean creates a peace and calm life nothing else. I began this piece with wet on wet Inktense blocks on watercolor paper. Then I lightened the color up with layers of Gelatos wiped with a baby wipe. Amy Wilson Wellenstein's Tangled was stamped on the background with white pigment and embossed to create a dreamy ocean. Amy's fish images Caerleon and Gawan were stamped and colored with Copics. 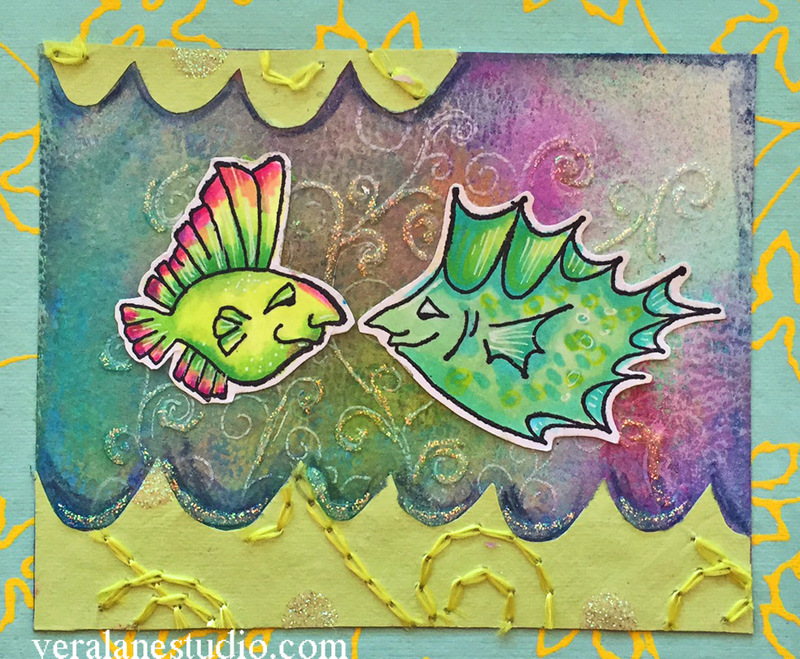 Share your version of under the sea or ocean inspired art and have a chance to win a $30 voucher to perhaps some ocean themed stamps in our monthly drawing. Simple prompt Sunday; Rotate, flip! Today I have a teaching moment for Simple Prompt Sunday. 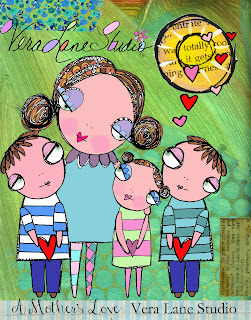 Digi newbies are just learning how versatile digi stamps can be. With the ability to resize to customize for your projects, ease of storage, economic sense, digis are becoming more popular. But today I challenge you to have a little more fun. Here is a link to my YouTube station where you will see how I rotate and flip images. 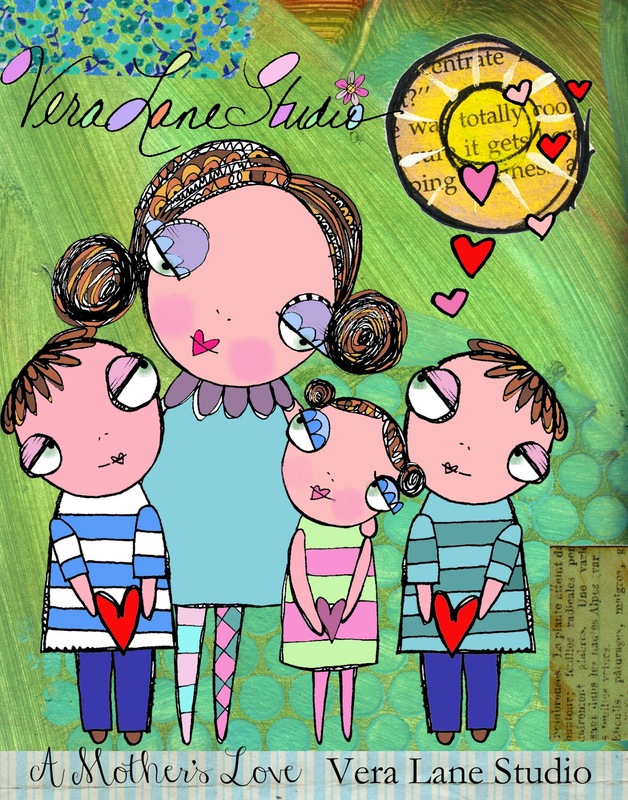 For today's image (again please excuse phone quality pic that is degraded by emailing to myself) I am using a 'morning doodle' that is a freebie located in the file section of the Vera Lane Studio FaceBook group. I duplicated the image, rotated and added scraps and pen to create an address frame for an envelope. I am challenging you to change up any VLS image with a rotation or flip! Feel free to use the digi provide in my file section on FB or any other VLS digi. This is our third Simple Prompt Sunday and I hope more of you will be playing along. 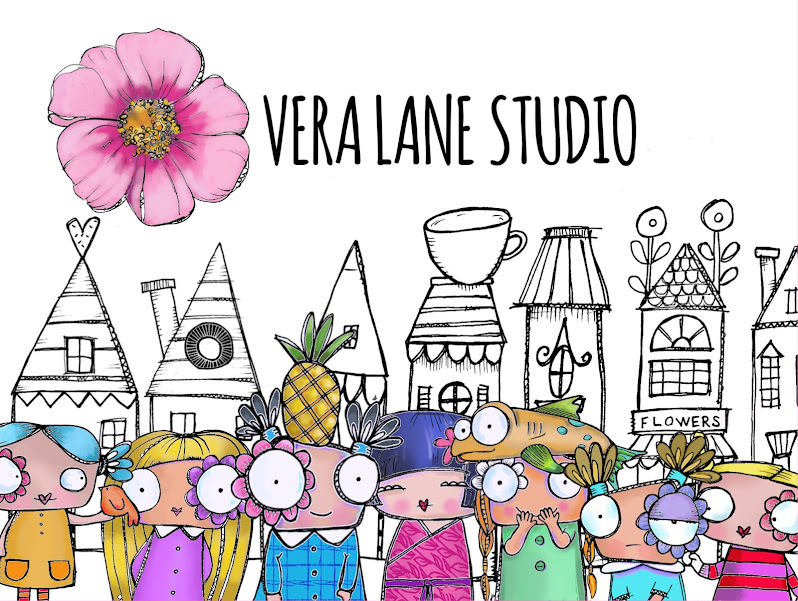 It wonderful to see how Vera Lane Studio sets are mixed and matched to create new scenes. I love seeing your unique vision, style, coloring and techniques. From newbies to advanced designers, the learning and sharing that is taking place is really quite lovely. Be creative. Pick a VLS character or your choice and add a hat, a headpiece, a crown or a bow. Have FUN and don't forget to post! 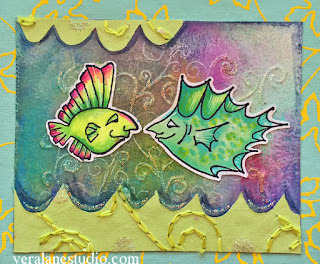 I am hostess this week over at the Stampotique Designer's Challenge and I am challenging you to create a set of Twinchies! What exactly is a "twinchie" ? If you have heard of inchies it's artworks that give you a little extra room to create -- exactly 2" x 2" of art! To make your twinchies simple trim cardstock or lightweight watercolor paper in 2 x 2 inch squares. 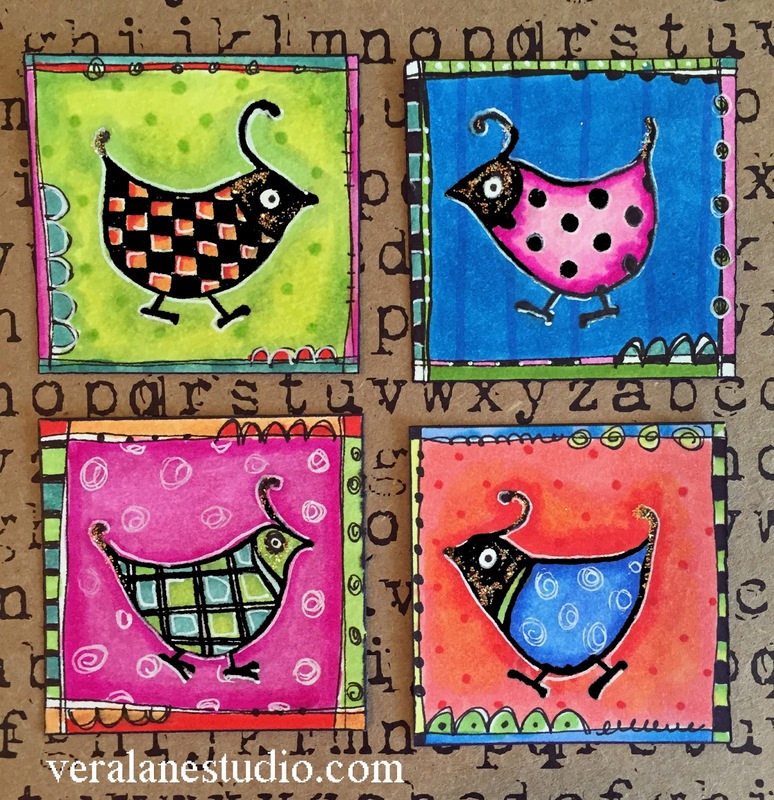 Sift through your Stampotique stamps and find smaller images or use larger ones to offset. Pick a common theme and balance your colors to create a cohesive set. 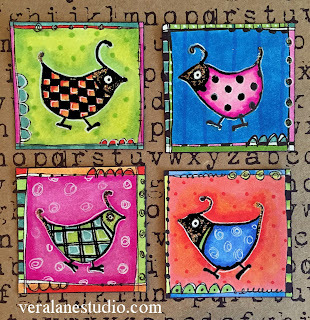 For my set I am using my quails cube - a versatile collection for four graphic inspired quails. I did the majority of my coloring with inexpensive BIC® markers -- they don't blend as well as a COPIC® marker but they are great to make the most of your art budget and reasonable to use with children. I added detail with a small point PITT artist pen. These are fun to create in sets and a great activity for children. With summer months still cooking grab your stamps and some pens and create sets for yourselves of with the kids. For those of you who have joined us last week bravo and thanks for posting! I stated these prompts would be simple for a creative quick fix. Sometimes simple is hard -- does that make sense? I heard some apologies out there. It's O.K. -- we are just having fun, right? But today's prompt IS simple. If you read the title you are probably now humming that obnoxious silly song that it's a near rip off from. Let's scribble it. Just a little bit. Simple prompt: Scribble a background for a tag. 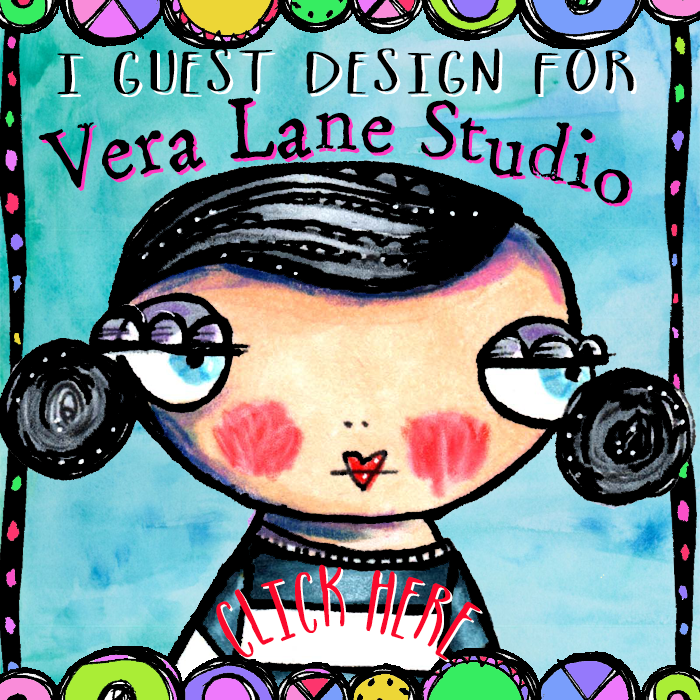 Attach ONE Vera Lane Studio image of your choice and snap a pic. Post it on our group page and mention what you liked or didn't like about the challenge. I love to scribble. Pencil is my favorite media to scribble in but you can experiment. I like to think of random thoughts or ideas and just let my hand move swiftly --- if words make no sense it doesn't matter, it's not meant to be read. Scribbles create a great visual texture and is a nice complement to a graphic image. You can take it up a notch, scribble over Gesso and add a little colored media. Or Gesso over your scribble to expose a tad of texture underneath. Splash it with watercolor, color with Inktense and drip water on it, smear some Gelatos with baby wipes. Play! Invent! The image in my sample is from Buds and Birds. It's a seven image digi stamp set with a couple of whimsical birds, a flower (as shown), a sun image (which can also be used as a flower) and a couple of sentiments. As with all my sets images can be used together or alone. Vera versatility! You never know when you need to pop a colorful and arty tag to a gift bag, bottle or wine, or cellophane bag of home baked goods. So scribble, and make someone happy. Welcome to Simple Prompt Sunday. Need a little art fix but don't have the time? 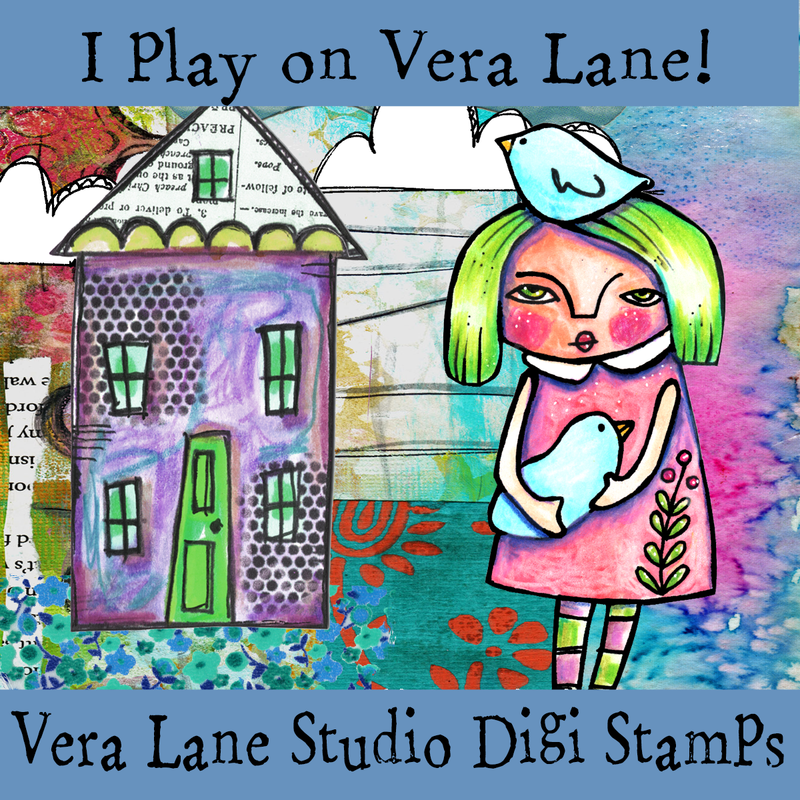 Join Vera Lane Studio Digi Stamps in a quick little layout. You never know when it becomes that perfect little card to cheer someone's day. Since today is the 5th of July you will create a 5 x 5 card with FIVE elements. 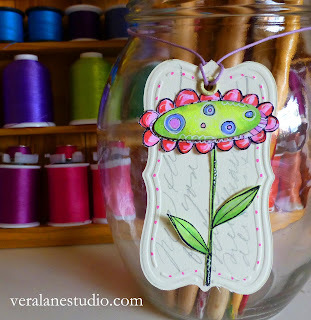 ONE must be a VLS digi stamp and FOUR must be random scraps from your stash. Try not to cut anything. 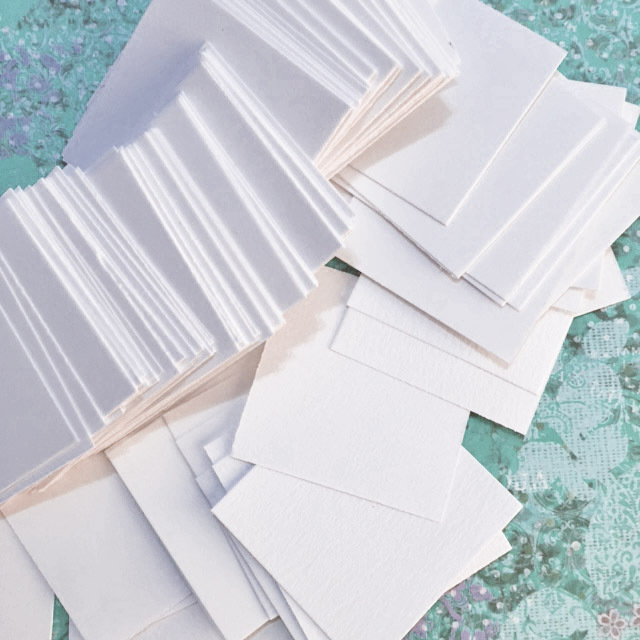 You may have scraps or even tags that are precut, but the task is to find "as is" and arrange. Please post your creation to our FaceBook page and hashtag the set you used. "A mother's love" now has a son. A mother-son image and single boy has been added to the set. Our BOGO offer in our Etsy shop ends July 4th. Our sets are affordably priced (cheaper than greeting card), versatile, and often with sentiments.